Preheat oven to 180°C. Crush biscuits and mix with melted butter. Press into a springform cake tin. In a large bowl, place the cottage cheese, vanilla seeds, custard powder, eggs, cream, oil and sugar and whisk until stiff. Fold in the rose water and the Yotti’s Turkish Delight. Pour the cheesecake mixture into the cake tin. Place in the centre of the oven and bake for 40 minutes. Switch off the oven, open the door and allow the cheesecake to cool in the oven. Once cooled, remove from the oven and carefully remove the cheesecake from the tin. For the jelly, place the strawberries and sugar in a large bowl with the water, stirring to dissolve the sugar. Cover the bowl tightly with foil and place over a pan of simmering water, without letting the bowl touch the water. Simmer for 20 minutes, topping up the pan with more water if needed, until the strawberries are very soft. Soak the gelatine leaves in cold water for 5 minutes. Strain the strawberry mixture through a fine sieve into a bowl – don’t press down on the fruit or the jelly will be cloudy. While the strawberry juice is warm, squeeze excess water from the gelatine, then stir the gelatine into the juice until dissolved. Stir in the rosewater. Cool completely, then place in the fridge for 15 minutes until just starting to thicken. 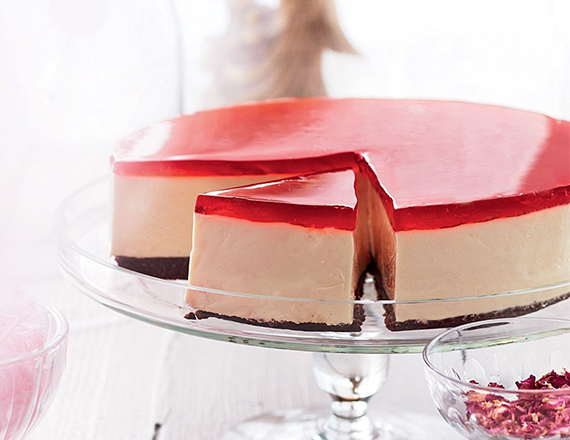 Pour jelly over the cheesecake, then return to the fridge for 3-4 hours until the top has completely set.